The World Bank Group (WBG) is planning to build a new office and facilities for its staff by early 2016. The event to celebrate the new office was held on Monday in Xieng Ngeun village in Chanthabouly district, Vientiane. Deputy Minister of Finance Ms Thipphakone Chanthavongsa and the World Bank Vice President for East Asia and the Pacific Region Mr Axel van Trotsenburg attended the ceremony. 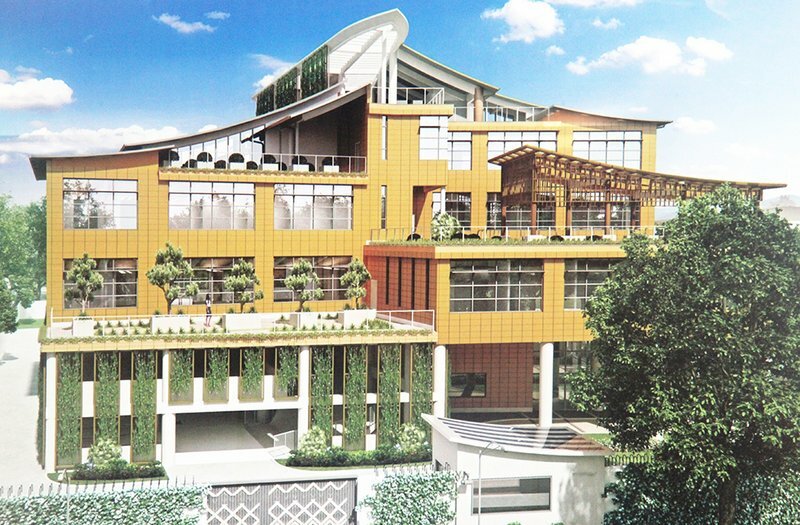 The three-storey Lao inspired building will accommodate 100 staff members and will be going green with a solar energy system, rainwater collection, emphasis on natural lighting, a sewage treatment plant and use of various sustainable materials. The office, which will house all branches of WBG,including the International Finance Cooperation (IFC), will also feature archeological findings for the public to view. The project of this new building is a testament to WBG’s long term commitment in developing a strong partnership with the Lao government and its people. Laos became a member of the World Bank more than 50 years ago and joined the IFC in 1998. The first WBG office was built in 1999, near the Patuxay monument. The partnership between Lao government and WBG has evolved and strengthened over the decades, with their aim of reducing poverty and promoting shared prosperity. World Bank has also provided over US$1.4 billion in grants and interest-free credits, analytical work and policy advice on key development issues in Laos. ???????­??­??????????­???????????????????­?????????­??????????????????????????????????????????­???????­?????­?????????????­??? 100 ??? ???????­??? 3 ???? ??????????????????????? 2016 ??????????????. ??­????????????????­?????????­??????? ???????????­??­???????????????????? ??????????? 23 ??­??­?????? ?????????????????????????????? ?????????? ???­?????­?? ???­??­???­???????????­????????????????? ?, ???? ???????? ????????????????? ??????­????????? ??????????­??????????????­?????­??????? ??? ?????????. ????­????????­??????????????­????????????????????????? ?????????­???????? ?????????????????? ?????????­????????????­?????????????­??? 100 ??? ??????­??? 3 ???? ??????????????????????????? ??? ?????­???????????????????????­??? ?????????????????­?????­???­??????????????­??? ?, ??­?????????????? ?, ??­?????????????????????? ?, ??­???????????­??????????? ??? ??????????????????????????????????????????????????. ??­????????­??????????????????­?????????????­??­??­???????????????????????­??­??­??????????????? ????????????­???????­???????????????????????????????? 2016 ??? ??????????????????­??????­?????????????????????????????­??­??????????????­?????????? ??? ??? ???????????­??????????????­??? IFC ???????????????????????????. ??­??? ??? ??????????????????????????????????­??­???????????? 50 ??????? ??? ?????????????­??­???????????­???????????­????????? 1998 ???????­??­????????????????????­???????????????????????????????? 1999 ???????­??????­????????­??­??????? ??? ??­??­?????????????????????????????­?????????????????????????????????????????­??­???????????????????????????????????????­??????? ??? ????­?????????????­????????????????????­?????????????????­??­?????????????­????????????­?????????????? ???????????????????­????????????? 1,4 ????????????­??­??????????????????????????? ??? ??????????????????????????????? ????????????­??­????????????????????????????????????­???? ??? ????????????????????­??­???????????­??????????????????­??­?????? ??? ??????????. Laos became a member of the World Bank more than 50 years ago and joined the IFC in 1998. The first WBG office was built in 1999, near the Patuxay monument. The partnership between Lao government and WBG has evolved and strengthened over the decades, with their aim of reducing poverty and promoting shared prosperity. World Bank has also provided over US$1.4 billion in grants and interest-free credits, analytical work and policy advice on key development issues in Laos. I sure wish that do occur as WBG stated. However, as I remember a long time ago when I work with world bank, we do get most of money to the poor people. Now I am retired from government position, I still hope to help the poor people to get a better living standard.